Happy New Year! Time sure flies and here we are in 2016! I hope you rang in the new year with vigor and surrounded by friends and family. I was lucky enough to be with most of my family and had a wonderful celebration. The new year offers the opportunity to reflect on the past as well as look forward to the future. I like the yin and yang of the holiday and recently came across a Dear Abby column concerning new year’s resolutions that I would like to share. Although I’m not one to make resolutions, I thought the following motivations would be a nice way to start the year. JUST FOR TODAY: I will make a conscious effort to be agreeable. I will be kind and courteous to those who cross my path, and I’ll not speak ill of others. I will improve my appearance, speak softly and not interrupt when someone else is talking. JUST FOR TODAY: I will do something positive to improve my health. If I’m a smoker, I’ll quit. If I am overweight, I will eat healthfully, if only just for today. And not only that, I will get off the couch and take a brisk walk, even if it’s only around the block. 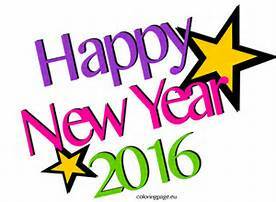 Happy New Year to you and I hope that 2016 brings you much happiness and joy!